76% of prospective clients chose to enter a new retail business based on visible signage. The same percentage was willing to recommend that store again based on its signage. The opposite proved true, as well. Poor signage worked against a likelihood that customers would visit a given retail location and/or recommend it. And finally, the quality of the signage proved much more a factor than the quantity. This is a possible entry point for digital signage. The installation of digital signage as compared with the continued use of conventional signage resulted in a 30% increase in customer loyalty and retention. Also there was a 46% increase in customer satisfaction and a positive perceived shopping experience. These numbers only improved for those retail locations that were early adopters of the technology with the first moving from 30 to 49%, and the second growing from 49 to 65%. So, statistics appear to bear out that not just quality signage, but quality digital signage must be a serious consideration in the marketing plan of a retail company today. Once it is understood that digital signage is the direction in which to move, a strategy must be developed to guide this movement in order to maximize the gain, given the commitment in resources. One or multiple screens with images promoting the latest products, promotions, or details on the particulars of a product proved beneficial in the implementation of digital screen technology. The “Diesel” company has utilized this method. These can be instrumental in creating a “theatrical experience” that demonstrates what a customer will feel when using a new product. These can be critical to get the customers involved with the products. They can also be a valuable tool for gauging customer interests based on their selections and the aggregate data compiled. These large screens dedicated to the demonstration of a product or series of products can be excellent tools to assist retail staff in product presentation and the building of value in a given product. It’s worth noting that technology alone will not sell a product. It takes a comprehensive strategy, developed through in-depth research, and implemented by a team who has taken the time to know the field, through study and experience. 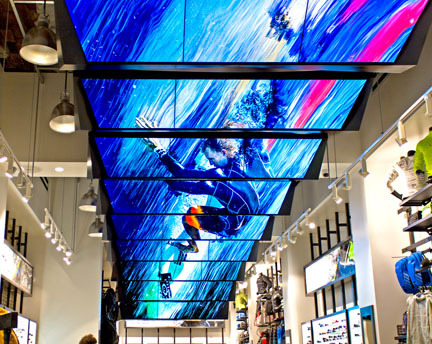 Citrus Sign Studio is the right team of skilled “artisans of the modern era” to bring all that the technology of digital signage has to offer, the sky truly is the limit in the world of retail sales.